Everything started out fine, I got the mochi cut in circles and the ice cream in perfect spheres. However then I actually tried to encase the ice cream in the mochi, and that's when the whole thing became a very literal mess. So I ended with some kind of chocolate soup spilled all over the floor and ended up just eating the sweet rice paste. Well this weekend I made a cake for my church's bake sale, so after my failure last week I thought I would go with something easier that I have made plenty of times: chocolate cake. Grease and line the base of a three two 9 inch cake tins and preheat oven to 180°C (350°F) (lower by 10°C for fan-forced). Sift together the cocoa powder, flour, salt, bicarb soda, and baking powder in a bowl. Using an electric mixer with a large mixing bowl, beat together the butter and sugar on high about 5 minutes until smooth and creamy. Add the eggs one at a time and beat until fully incorporated.Mix together the water and milk. Stir half of the dry ingredients into the butter mixture, the add the milk mixture. Finally stir in the other half of the dry ingredients until smooth. Split batter mixture between the prepared tins. Bake for about 20-25 minutes, or until a skewer inserted into the centre of the cake comes out clean. Remove from the oven and cool in tin about 5 mins, then place on a wire rack and cool completely before icing. Cake can be baked the night before and stored in an airtight container overnight before assembly. Place chocolate in a large mixing bowl. Heat cream over low-medium heat in saucepan until just boiling, pour over cream and set aside for 5 minutes. Use a whisk to combine mixture until smooth, then gradually add raspberry puree to taste. Chill until it thickens but is still pourable (take care not to leave too long or it will make it hard to spread). This mixture is prone to splitting as it cools, if this happens just reheat the bowl over a simmering saucepan of water and add a bit more cream. 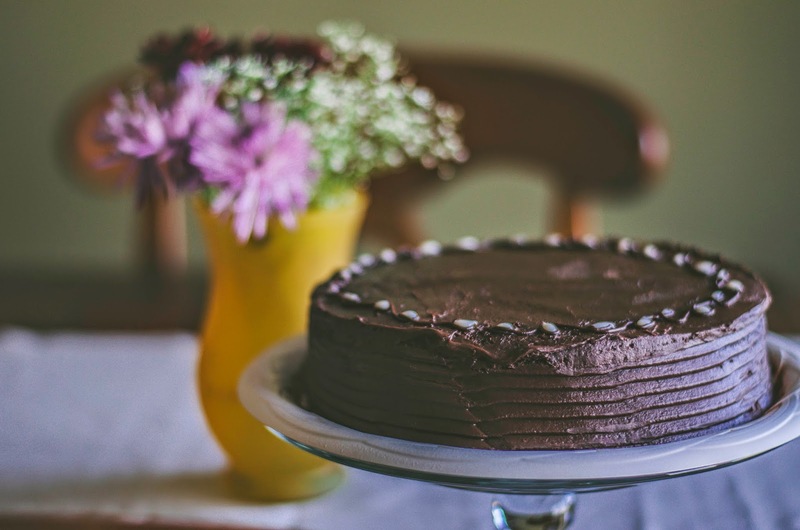 Place one layer of chocolate cake on your cake stand and cover with ganache. Sandwich second layer on top and repeat. Place chocolate in a large mixing bowl. Heat cream over low-medium heat in saucepan until just boiling, pour over cream and set aside for 5 minutes. Use a whisk to combine mixture until smooth. Chill until it thickens and just holds its shape but is still pourable. 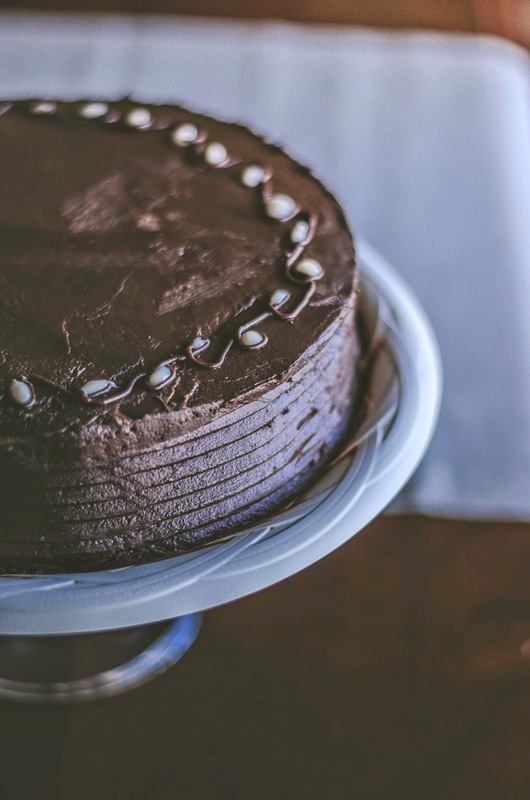 Use a spatula to spread over the outside of your cake. I used an offset spatula to smooth the surface. Place macarons around the border of the top of the cake. Decorate center of the cake with raspberries. Chill cake until ready to serve, remove from fridge at least 30 mins before serving.